The Denver Catholic Worker Soup Kitchen is an ecumenical group of volunteers who have run a soup kitchen for 30 years to provide food for those who are in need. Our soup kitchen is in downtown Denver. 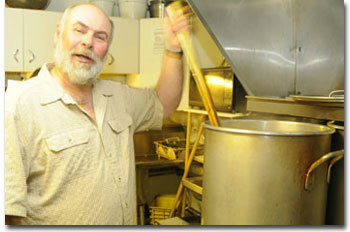 The soup kitchen currently serves 30,000 meals per year. There are hundreds of hungry people in the metro Denver area, and unfortunately, the need is increasing. There are hundreds of others who have the means to provide food, but are in need of personal transformation. The Catholic Worker Soup Kitchen is a place of honor, of privilege, and of joy for those who serve and for the recipients of the delicious hot meals.